Excellent Bed & Breakfast ! Tout était parfait et le rapport qualité/prix très correct ! Très bon accueil des propriétaires, petits déjeuners copieux et environnement exceptionnel...par beau temps, la vue de la véranda est superbe ! Nous recommandons cet établissement sans aucune réserve !!! We had a lovely stay. Mary was a gracious hostess. The room was great and tidy with a great view. Breakfast was wonderful as well, followed by a great trip to Skellig Michael arranged by Mary. Top notch. A wonderful place to stay with the best hosts. Our second time in Portmagee and our second stay at Shealane Country House. When we go back we will stay there again. I highly recomend this B&B to all who go to the Portmagee area. Perfect! Mary and her husband were both wonderful and welcoming hosts. They couldn't have been more helpful and the room we had was beautiful and immaculately clean. It was spacious and they provided everything we needed. There was great variety on the breakfast menu and the food was lovely. I will definitely be back and can't recommend this b&b highly enough. A very pleasant and friendly introduction to Ireland. Spacious ensuite double with stunning views up and down the lough. Very comfortable. Good breakfast with extensive choice. Amazing panoramic view from the breakfast room. Mary was very helpful with advice on where to go and providing some maps for walking. Worth confirming your booking, rather than relying on bnb-network Mary thought our booking was cancelled - luckily she had space. As first time visitors to Ireland we were disappointed with the lack of walking opportunities - most of the coast is private farmland. If wanting to walk extensively, plan ahead - there are some pretty walks which are well waymarked, but not as many as you might expect, and not well advertised. Get a decent walking map before you arrive, the tourist information office in Cahersiveen was pretty useless in this respect. Would definitely recommend Shealane House as a B&B, though. Rooms are nicely decorated with comfy beds and soft, comfortable towels. A good selection for breakfast with a terrific scenic view to enjoy for the morning. 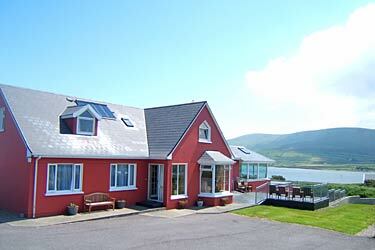 Convenient walking distance to Portmagee to take morning ferry to Skellig Michael. Unfortunately the ferry co Murphy would not let us off the boat to Skellig Michael due to choppy waters while we witnessed other tourists getting off ferries before and after we were near the island. The owner also recommended to drive up to the tallest hill on Valentia Island which had a spectacular sunset view of the whole island. Overall, one of my top b&b experience in ireland. An amazing place run by a wonderful and caring woman named Mary! I highly recommend this place to anyone considering a trip to Valentia Island!